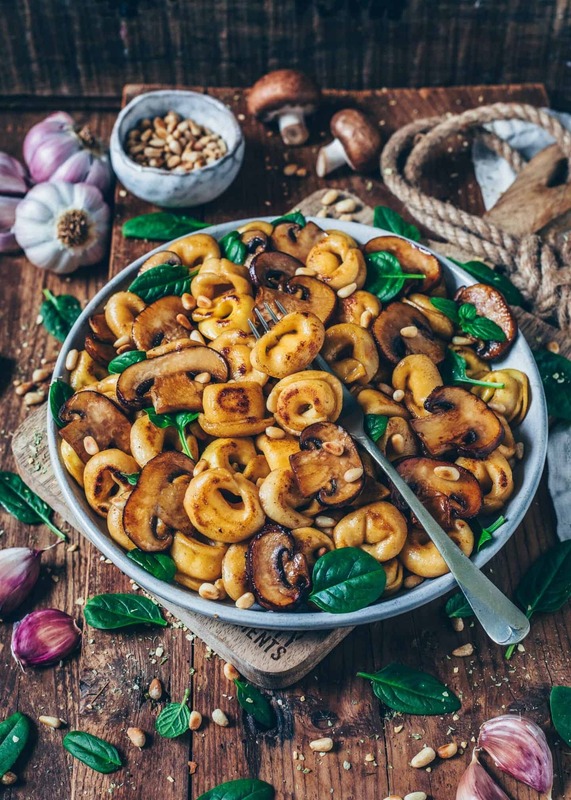 Homemade Vegan Tortellini filled with Almond Ricotta is super easy to make and so delicious! 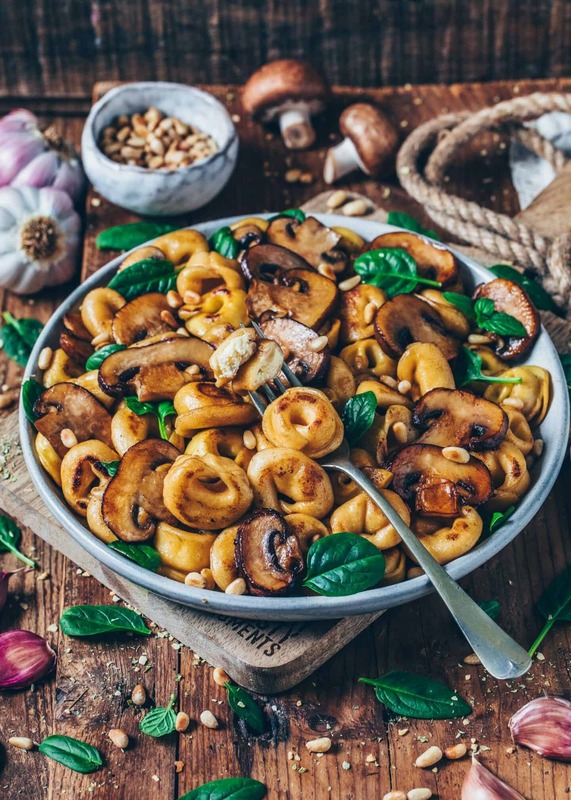 This Pasta Recipe is a step-by-step guide to making the perfect Vegan Cheese Tortellini with fresh pasta dough. 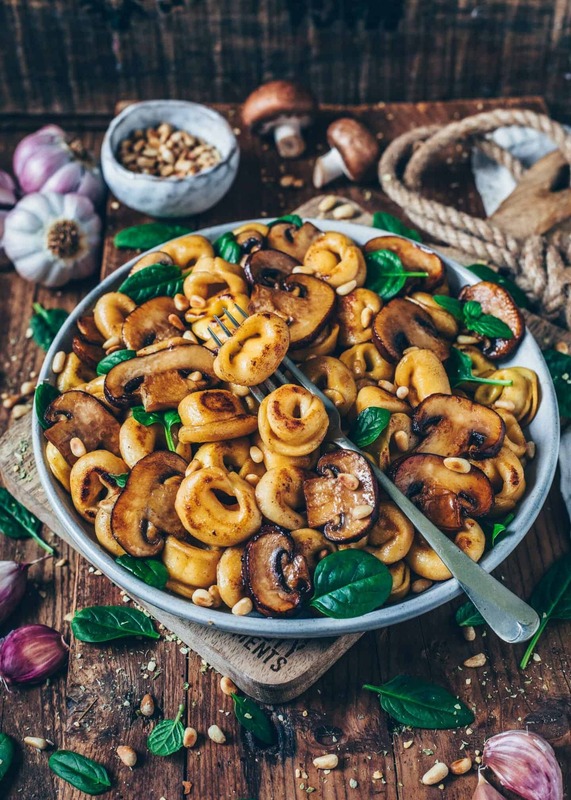 To make Vegan Tortellini, we need only a few simple ingredients. First, prepare the Homemade Pasta Dough and the filling. I’ve chosen an Almond Ricotta Filling, but you could also make another kind of filling (I will talk about it later). After the dough has chilled, cut it in half or in quarters, making it easier to flatten. Start rolling out one dough piece flat (about 0,075-inch) on a floured working surface. Using a 1,9-Inch round cutter, cut out rounds, spacing them as close together as possible. Gather the scraps into a ball and put them with the remaining pieces of dough to re-roll later. Add about 1/2 teaspoon of the filling into the center. I use a piping bag to do that because it’s easier and done faster, but you can also just use a teaspoon. Brush half of one round with a little water, using your finger or a small brusher. Then fold one edge over the filling to the other side and press to seal the edges. Now take the left and right corners and twist them around to meet each other and stick them together, using a dab of water with your finger. Continue with the remaining rounds and filling to make more Vegan Cheese Tortellini. Pasta dough dries out quickly when uncovered. So if it’s your first time making tortellini, you may need a little more time to fold them. 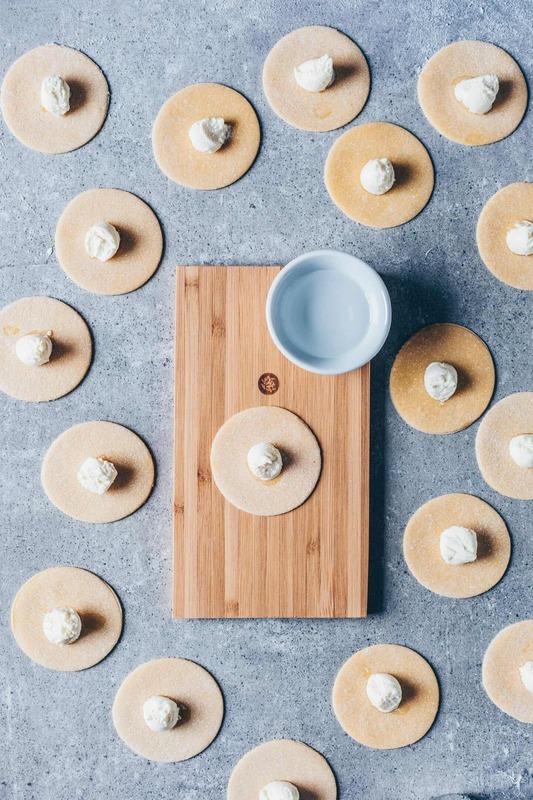 While doing this, I recommend that you keep the remaining pieces of dough and the rolled out circles covered with a piece of plastic wrap or a lightly damp dish towel. I really love adding a lot of filling into my Dumplings! 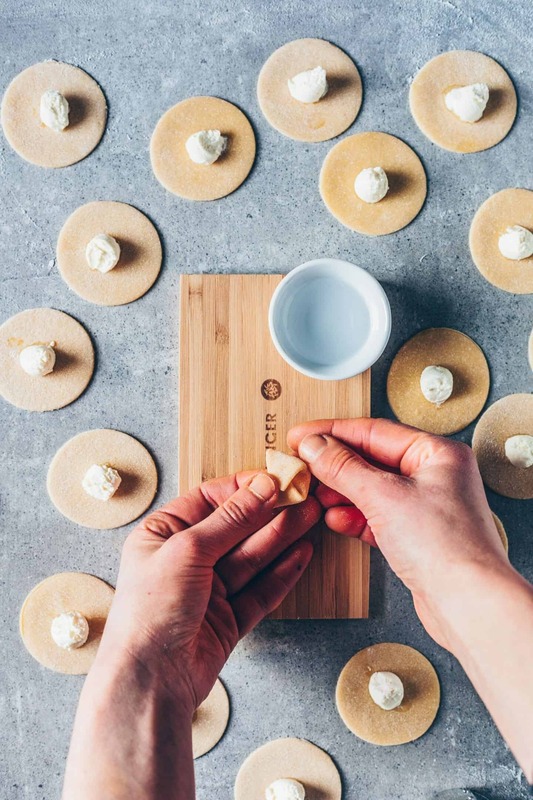 But when you over-stuff them, it gets tricky trying to seal the edges, and when they’re not perfectly sealed, the filling will most likely spill out during cooking. While the flattened dough rounds dry out fast, the shaped tortellini stick quickly to the working surface or to each other. 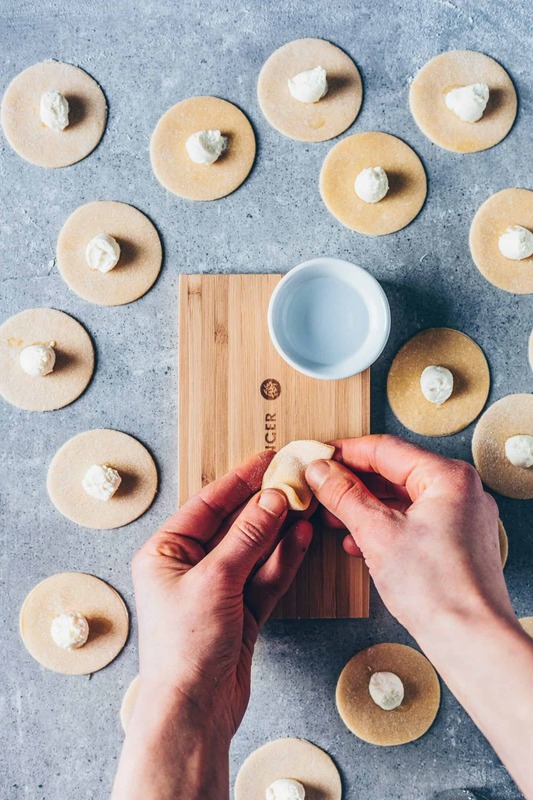 So please make sure to keep both the working surface and the tortellini dusted with some flour or cornstarch and try to not let the shaped tortellini touch each other. 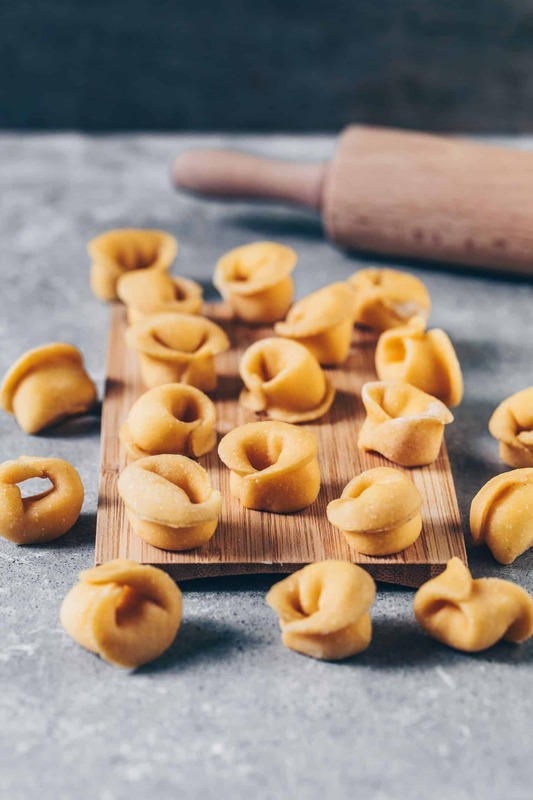 Although this recipe is fairly easy to make, you’ll need some time until you’ve shaped all of your Tortellini. So make sure you have enough time or prepare them in advance and freeze in batches. 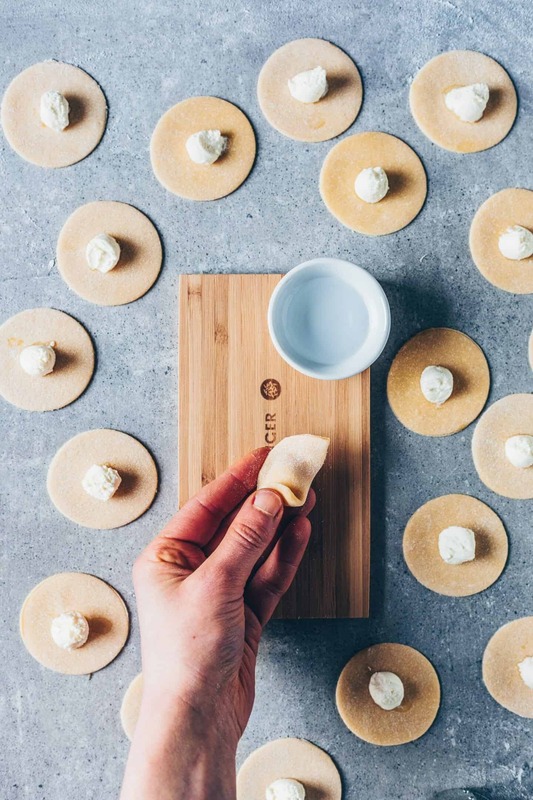 I filled my Tortellini with homemade Almond Ricotta, which is very easy to make and tastes so delicious! However, you could also use another filling instead of making Vegan Cheese Tortellini. For example, a stuffing made of Spinach, Mushrooms, Pumpkin, Cashew Cheese or Pesto is a great choice! 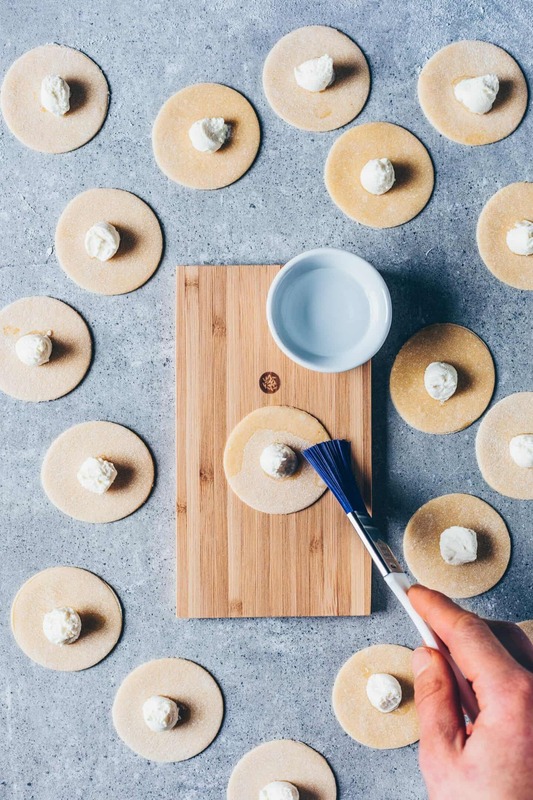 Any Homemade Pasta Recipes, such as Ravioli or Dumplings, require a fair bit of work, but they‘re definitely worth it! 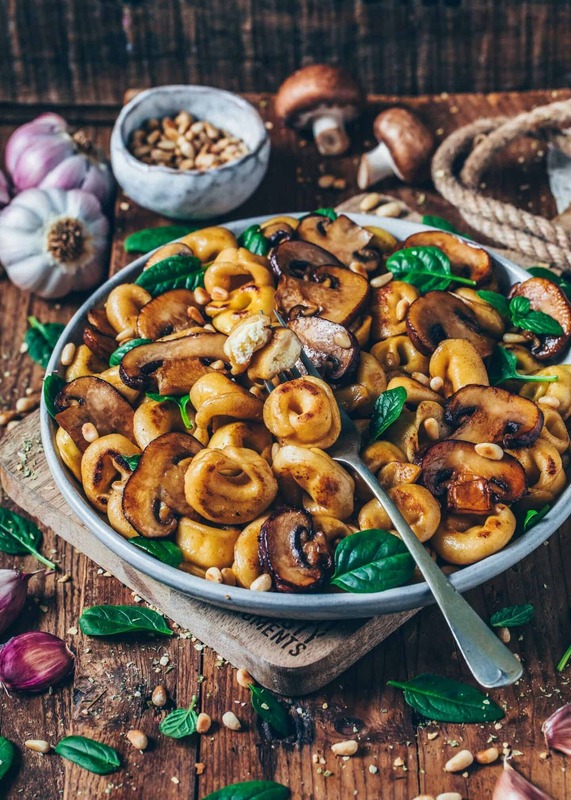 As I mentioned before (Step 4 of the Tipps), you can prepare these Vegan Tortellini in advance and freeze them in batches for future days, so you can always have fresh Homemade Vegan Cheese Tortellini in only a few minutes! Fresh pasta has a very short cooking time, about 5 minutes only! When they float to the surface of the cooking water, they’re done. If you’re like me, you’ll love this stuffed pasta, even more, when it’s crispy pan-fried! 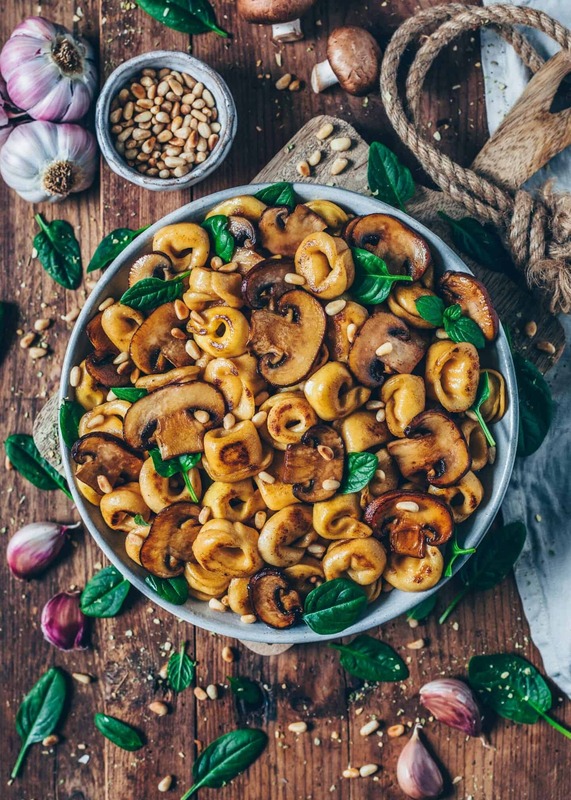 Especially, when served with garlic mushrooms, it’s my favorite combo! However, to be honest, I love anything that is crispy roasted, also Gnocchi, Pierogi, Ravioli, or Gyoza Dumplings. 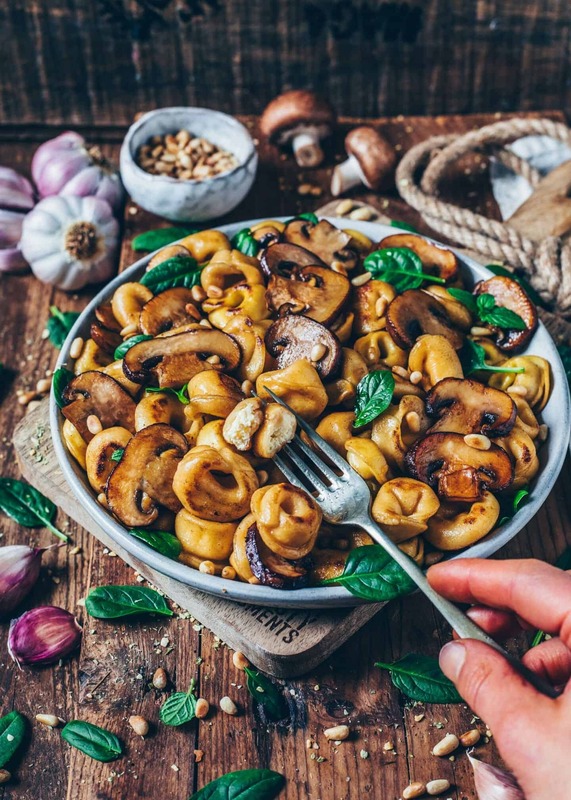 When you want to enjoy them simply boiled, I recommend serving with a creamy sauce, such as my beloved Vegan Cheese Sauce, Guacamole, Avocado Basil Pesto or any other Pasta Sauce or Pesto to it. 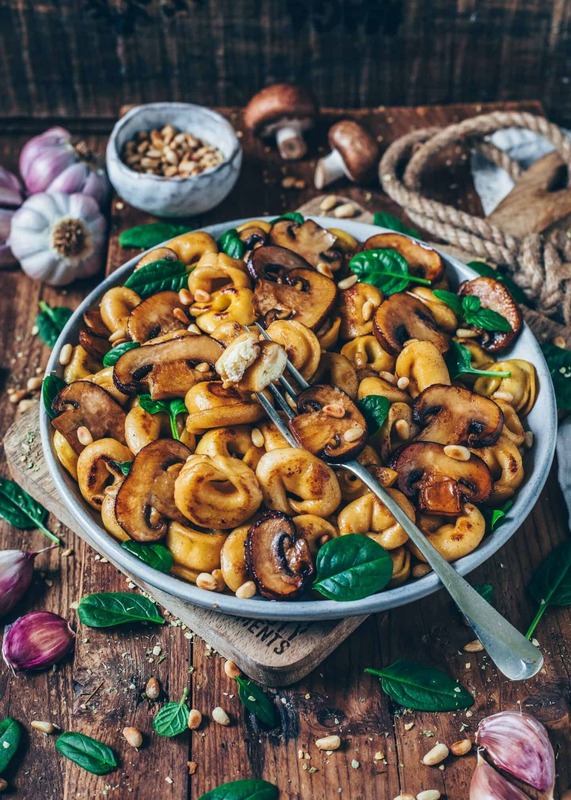 Homemade Vegan Tortellini filled with Almond Ricotta are easy to make and so delicious! 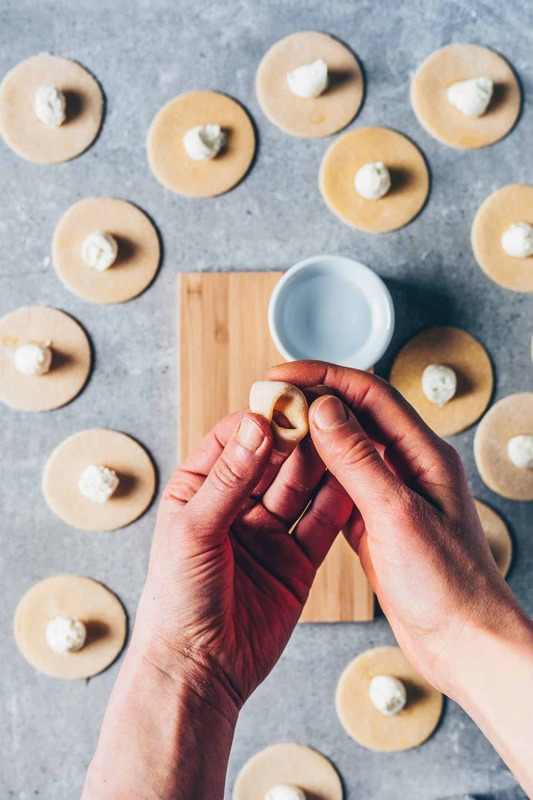 This Pasta Recipe is a step-by-step guide to making the perfect Vegan Ricotta Tortellini with fresh pasta dough. Prepare the Homemade Pasta Dough according to this recipe. Cover almonds with hot water and soak for at least 1 hour or best overnight. Then drain. Drain the tofu, then wrap in paper towels and press well to remove as much of the liquid as you can. 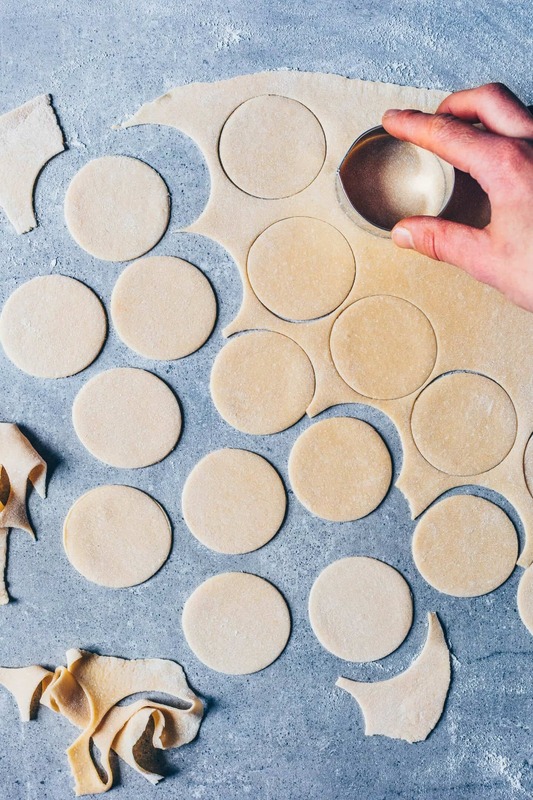 Cut chilled pasta dough quarters (making it easier to flatten when you work with one piece at a time). Roll out one piece flat, about 0,075-inch. Using a 1.9-Inch (4,5/5 cm) round cutter, cut out rounds, spacing them as close together as possible. (Gather the scraps into a ball and put them with their remaining pieces of dough to re-roll later). Add about 2/3 teaspoon of the filling into the center, using a piping bag or just a teaspoon. Brush the half of one round with a little water, using your finger or a small brusher. Then fold one edge over the filling to the other side and press to seal the edges. Now take the left and right corners and twist them around to meet each other and stick them together, using a dab of water. Toss with a little flour and set aside on floured sheet. Repeat with the remaining rounds, pieces of dough, re-roll the scraps to make more tortellini. At this point you can freeze them in batches or cook (and pan-fry) to serve immediately. Bring salted water to a boil in a large pot. Add the ravioli and simmer for about 5 minutes until they float to the surface. The filling can be varied to your wish. Instead of almonds, you could also use cashews to make cashew ricotta. If you’re allergic to nuts, you can use sunflower seeds instead. More suggestions about how you fill them can be found in the text above. 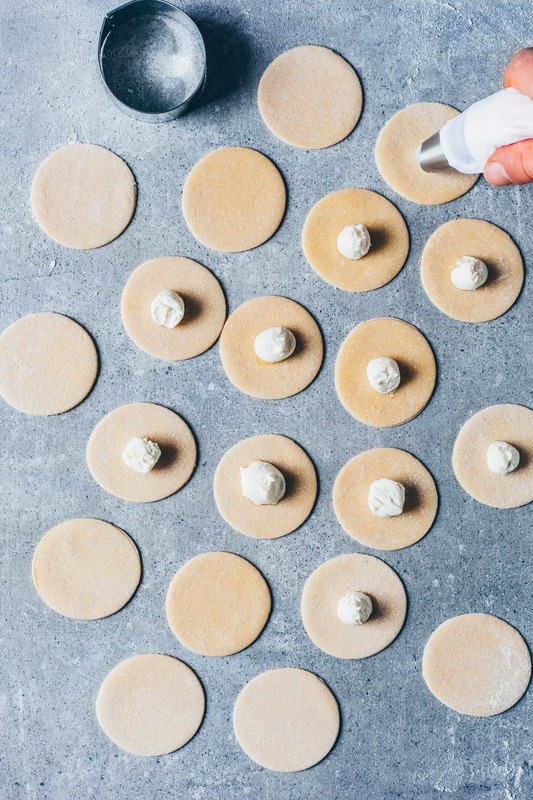 If you want to freeze the Tortellini, place them in a single layer on a sheet, leaving some space between each to prevent them from sticking. Freeze for 1-2 hours until firm, then transfer to a freezer bag. To serve, simply cook them right out of the freezer. You don’t need to thaw them before cooking, just steam them for 1-2 minutes longer until soft. Please read the "Tips to make the perfect Tortellini" in text above.